Two startups developing methods to turn biomass, like plants and waste, into fuels and chemicals have just closed large rounds of financing from venture capitalists. Genomatica, which makes green chemicals announced it’s raised $41.5 million in a series D round, while Solix BioSystems, which turns algae into biofuels and chemicals, says it’s raised $31 million in a series C round. About this time a year ago, biofuel and biochemical startups were aggressively seeking to go public. Amyris, Gevo, Solazyme and KiOR were all able to have public debuts within the past two years. But these companies’ stocks, and their long timelines for delivering their biochemicals and biofuel products, have mostly disappointed. KiOR is trading at $7.19, down from its IPO debut of $15 per share; Amyris is trading at $3.31, down from a debut price $16 per share. While Genomatica announced its new funding on Thursday, it also filed a withdrawal form, removing its planned IPO. Genomatica filed for a potentially $100 million IPO a year ago. In the filing Genomatica sited “current market conditions” as the reason for withdrawing the IPO. Genomatica’s new funding comes from Alloy Ventures, Draper Fisher Jurvetson, Mohr Davidow Ventures, TPG Biotech, VantagePoint Capital Partners and Waste Management (disclosure: Alloy Ventures is also an investor in GigaOM). Genomatica has now raised at least $125.7 million. Solix BioSystem’s new funding was led by I2BF Global Ventures, and previous investors include Shanghai Alliance Investment Ltd., or SAIL, Valero Energy, Southern Ute Alternative Energy, which manages clean power investments for the Southern Ute Indian Tribe, Bohemian Investments and Infield Capital. According to the Cleantech Group biofuels and biochemicals received 14 percent of venture funding for cleantech in the second quarter of this year. New biofuel companies are barely getting any funds, but more established firms continue to be able to draw down capital. Algae company Sapphire Energy closed $144 million in the second quarter of this year, while waste and biogas company Harvest Power closed $112 million. Genomatica creates organisms that can turn sugar or synthesis gas into a variety of products, from chemicals for plastic to transportation fuels. The sugar or syngas comes from plants, wood chips or trash rather than the more traditional method of using crude oil or natural gas. Genomatica’s first product is 1,4-butanediol, or BDO, which is made from using sugar-eating E. coli, and is used for making things like spandex, running shoes and plastic auto parts. 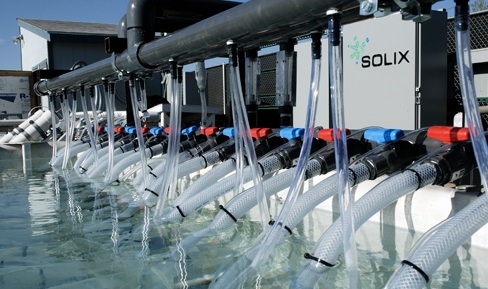 Solix BioSystems has developed bioreactors that grow algae to turn it into fuels and chemical feedstocks, and more recently it decided to also commercially grow the algae. Solix says it will use the funds to start producing and selling its product commercially. Interesting that biofuel companies now tout chemical products for industrial and manufacturing uses versus previously only talking about their clean energy uses.